Breaking into the “Deadly Looking Dozen” is the now ironically named but all together obsolete Cataclysm set. I wonder when this set was created if the developers had any idea that a few years later, the games third expansion would carry this name? 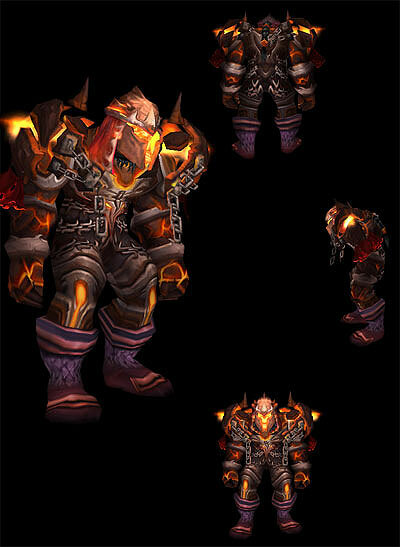 Nonetheless this is a really epic looking set that, like tier 12 is all about the fire look. Pushing that aside tier 5 still looks great with the “chain art” and fire and brimstone shading but does lose some points for a helm that I always thought was a bad match with the rest of the set. This entry was posted on July 9, 2011 at 12:08 am and is filed under General, HFL, MMO, Raiding, Role Playing, World of Warcraft. You can follow any responses to this entry through the RSS 2.0 feed. You can leave a response, or trackback from your own site.